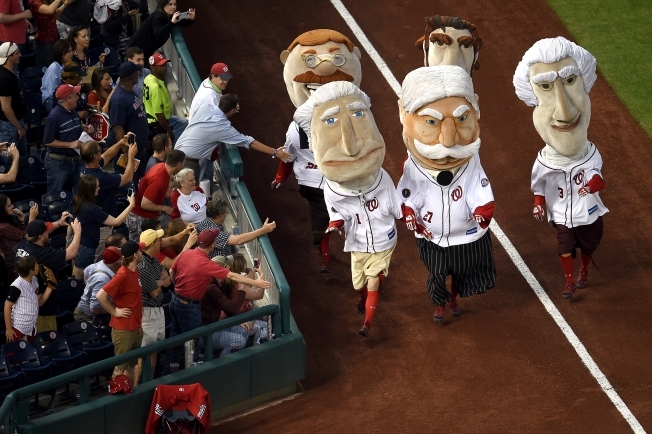 Four of the Washington Nationals' Racing Presidents stopped by Ronald Reagan Washington National Airport to greet and help board Delta customers on a flight departing for Atlanta. The presidents' appearance Monday coincides with opening day. In late March, the Nationals and Delta announced that the airline will fly the team to and from their away games. Delta, now the team's official airline, will also have a presence at Nationals Park with signage on the outfield wall and out of town scoreboard, among other things. The presidents appearing at Reagan National will be: George, Abe, Tom and Teddy. No word on where William Howard Taft will be.